Marie is a BE Accredited Coach, BHS Stage 5 Performance Coach & Rider & UKCC Level 3 Eventing Coach. She competed internationally at 3 and 4* level and was a longlisted reserve for the Athens Olympics. She is passionate about supporting and encouraging each individual rider and their horse to achieve their best irrespective of discipline, level or age - and doing it with a smile. She is an empathetic instructor who encourages the best from horse and rider. Marie is available for private and group lessons and is happy to teach all abilities from Pony Club to four star level eventing. She regularly provides clinics covering all three disciplines across the country and will be holding some BE courses over the autumn/winter/spring periods. To see upcoming clinics and book a place, please see the 'Calendar' page. 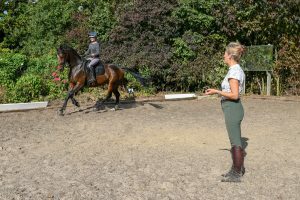 Lessons can be given at your own yard or one of the many locations Marie regularly coaches. One to one private lesson duration is generally 1 hour. Group lessons are for a maximum of 4 riders and the duration can be 1 hour show jumping or 1.5hrs xc. To book private coaching please get in touch with Marie directly using contact details on the Contact page. Marie teaches at home in Herefordshire and also South Wales, Midlands & East Anglia. She is willing to travel abroad and has previously coached in Germany & Dubai. "Marie is an instructor who has helped me gain confidence, especially over fences. She is a supportive and very committed coach making all sessions rewarding, progressive and enjoyable. Marie has gently pushed and inspired me to achieve much more than I had anticipated with my mare. I would recommend Marie for coaching in all areas of equitation." "Marie is a wonderful, encouraging and supportive instructor who has a great way of explaining things which she combines seamlessly with outstanding coaching skills. She is completely invested in helping you become the best that you can be and makes everything seem possible. I started having lessons with Marie at a time when my confidence was at rock bottom. Her incredible patience and supportive approach has given me back my self-belief, vastly improved my riding ability and enabled me to develop a true partnership with my horse. I would wholeheartedly recommend her to anyone looking for a top class instructor and coach." I have been having lessons with Marie Ryan for 12 months. I have gone from being nervous jumping a 60cm fence, to confidently jumping 90-95cm show jumps and 80-90cm cross country fences. To some this may not seem very big – but my nerves were crippling me - Marie’s hugely calm and kind method of teaching has taken me to a place where I don’t even ask the height of the fence. Marie’s talent lies in the way she always emphasises the positive. Even when you are feeling low as you knocked one or two fences down, she turns it around and reminds you how many you jumped perfectly. Her understanding of both horse and human psychology makes her very different from other trainers. She gets to know you and the horse, and treats you as an individual not as ‘a group’.